I decided 2016 is going to be the year I sew with my scraps. The bins where I keep my scraps are overflowing and taking up a lot of space in my sewing room. In fact, my fabric stash in general is taking up way too much space in my sewing room. So this year, I'll be sewing with scraps and with my own stash. 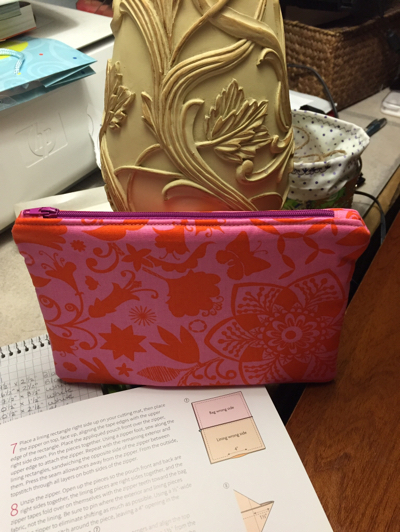 To get myself started, I decided to make pencil holders for my sewing room. I used this tutorial as a starting point. I made a green one using green scraps for my crayons. A blue one using blue scraps for my washable markers. And a pink one using pink scraps for my cutting tools. I have to say, these are little bit addictive - and when my sweetie came in to my sewing room earlier this week, he asked me to make him one for his computer desk upstairs. Now that's a compliment! Even though I completed these in 2015, I'm going to count these as scrappy project #1 and I'm going to be linking up at Crazy Mom Quilts for Finish It Up Friday. Here's to a wonderfully creative and quilty 2016!!! 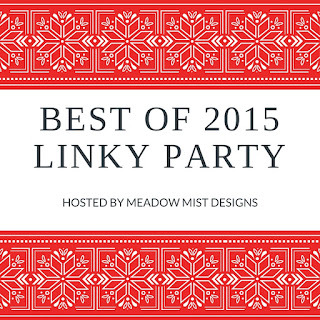 When Cheryl of Meadow Mist Designs announced that she would host a link party and invited us to write a blog post about our Top 5 blog posts of 2015, I knew I had to participate. Looking back on the year is something I always do before setting goals for the new one. And so instead of just listing the blog posts that received the most visitors or comments, I decided to compile a list of "firsts". 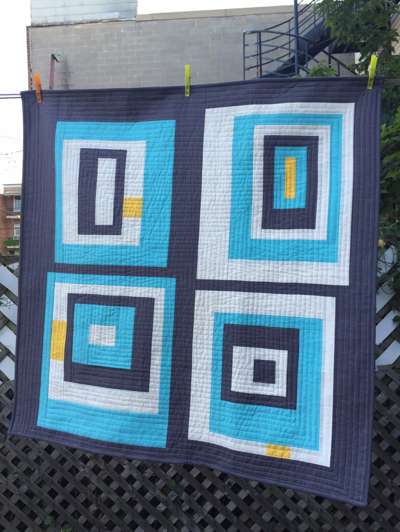 FMQ Sampler - This sampler was my first QAYG finish. I learned so much while making this quilt. SuperNova - My SuperNova quilt was my first collaboration. Half of the blocks were pieced by Julie of It's Sew Julie! 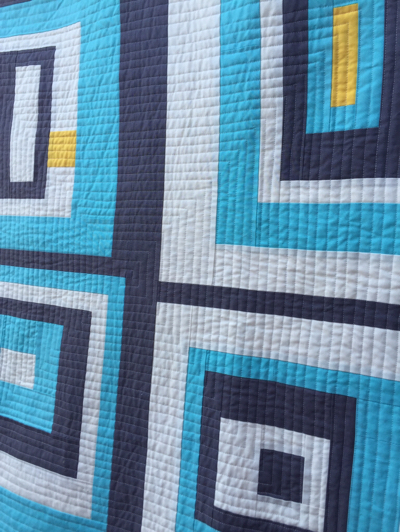 I had a blast making this quilt and got to know a bloggy friend better in the process. Festive Forest - This Festive Forest quilt was the first time a fabric designer asked me to make something for a new collection. Tamara of Tamara Kate Designs supplied the fabrics for this and I had an awesome time playing with these gorgeous designs. QAYG Bed Quilt - This QAYG bed quilt was my first big quilt made without a pattern. I found a picture on Pinterest and used graph paper to design it. I then pieced the quilted sections together using the QAYG method I learned the previous Fall. The Guitar Quilt - The Guitar quilt was my first pixelated quilt. 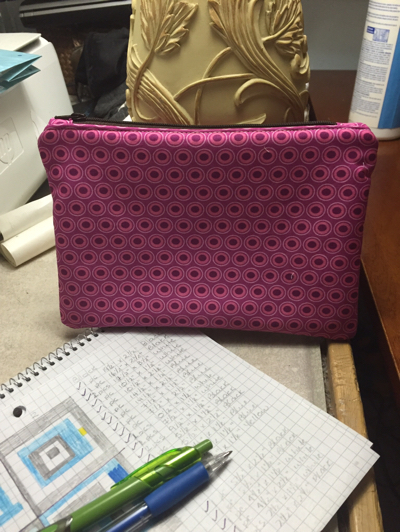 I used a pattern as a starting point, but then changed it a bit using graph paper. A huge thank you to Cheryl for organizing such a fun link party! I loved going back through my blog posts from the last year! I AM FINISHED! I managed to sew all of the gifts I wanted to make and today is only December 22! I had to spend 2 late evenings and most of Saturday to get it done, but it is done. My last makes for this year are lunch bags. These are for the working girls in my life - my sister Caroline and my sisters-in-law Sandra and Janik. I used fabrics from the Birch Farm collection by Joel Dewberry. I didn't make one for myself but I might have to do just that after the Holidays. These are just too cute! And now I can just relax and enjoy the Holidays! Yay! 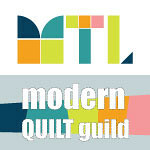 I will be linking up at Crazy Mom Quilts and at Knit Spin Quilt for TGIFF. I've been sewing up a storm here making presents for the family. I have now made one Guitar quilt for my sweetie, one dog pillow, one cat pillow and a coffee mugs wall hanging. This week, I played with zippers! 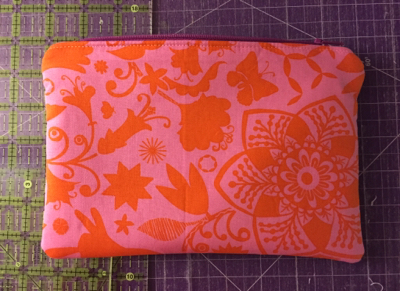 I decided to make Two in One Pouches by Sotak Patterns for three of the ladies. Before making the ones to give away, I thought it might be best to make a practice piece. I was going to keep that one, so I selected fabrics I really liked (in purple of course) and got started. Within one evening, I had this cutie all made. I thought this was a resounding success so the following night, I selected fabrics for the three pouches I needed to make. Now that I knew what I was doing, making all three only took one evening! This one is the smaller size (3.5" x 5.5") and is for Marianne. She's a bit of a cat lady this daughter of mine so this cat fabric is just perfect for her. A large size (4.5" x 8") in Birch Farm fabrics for Melissa, my wonderful daughter-in-law. The contrasting fabric is Kona Caribbean. And another large pouch for Kat, my "pretend" daughter-in-law (it's a long story!). I just love those butterflies! I am super pleased with these and hope the girls love them too. If you are looking for a quick, easy, but really fun, practical gift, I highly recommend this pattern. Are you like me and up to your eyeballs in Christmas making this week? I would love to know what you're making! Linking up at Crazy Mom Quilts and at Crazy Dutch Bird Quilts for TGIFF. This little wall hanging is for Brittany, my step-daughter. Brittany moved out about a month ago so I wanted to make something she could hang on the wall of her tiny kitchen and be reminded every morning that her dad and I love her very much. The pattern is by Amanda Jean Nyberg and is exclusive to Connecting Threads. I chose red scraps for the coffee mugs and Kona White and Kona Snow for the background. The binding is a red print I bought many, many moons ago at JoAnn's. I quilted it with my walking foot, with curvy lines about 1/2" apart in two different directions. I just love the texture it gave the quilt, but some of the coffee mugs got distorted a tiny bit - I wonder if it's because of the quilting itself or because I didn't baste the sandwich close enough. What do you guys think? Has this happened to you before? Do you know how to avoid it? I will be linking up at Crazy Mom Quilts for Finish It Up Friday and at Crazy Dutch Bird Quilts for TGIFF. I finished another one of the Christmas presents I've been busy sewing up this month! Earlier this week, I shared the Dog Gone Cute pillow I made for Jon's girlfriend Anna. I figured I would stay with the animal pillows theme for the blog post and introduce you to Charlie, the Geometric Cat. Charlie is actually the name of my step-daughter Brittany's kitten and he is just the cutest thing in the world. Brittany's roommate and best friend Camille loves that kitten so I thought making her a pillow with Charlie on it would be a perfect gift. This is Charlie! Isn't he adorable?! I got the pattern over at Quiet Play - I just love her paper-piecing patterns! I used scraps for the cat, some Kona for the background (Bahama Blue and another blue - sorry don't remember the exact colour) and some Zen Chic for the border. For the quilting, I used the walking foot and quilted straight vertical lines about 1/2" apart using Aurifil white thread. The finished size is 18" square. For the backing, I chose a brown print I had in my stash and made a simple envelope closure. I'm super happy with this pillow and I hope Camille loves it too! Now I can't wait until Christmas morning! I will be linking up this small finish at Crazy Mom Quilts for Finish It Up Friday and at Quilt Matters for TGIFF. During the whole month of December, I plan on making presents. I decided to make a little something for all the women/girls in the family. I haven't yet made up my mind as to what everyone is getting, but choosing what to give our son's girlfriend, Anna, was super easy once I saw the Dog Gone Cute pattern by Sew Fresh Quilts. You see, Anna has a French Bulldog... And she loves that dog! 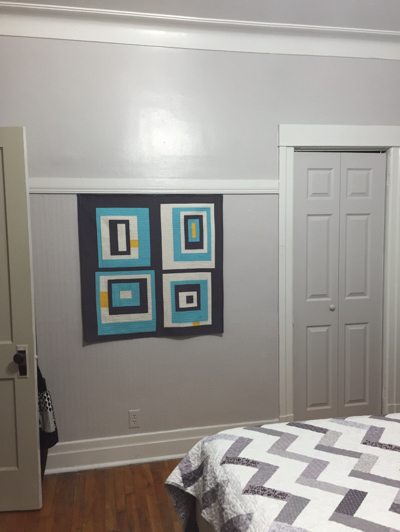 The large version of the block measures 18" x 12" and I have a bunch of 18" pillow forms... perfect!! I chose some Carolyn Friedlander black crosshatch for the face, some "Good Neighbors" fabric by Amanda Jean Nyberg for the ears, Kona white, black and Ash for the background. For the quilting, I went with straight lines in a radiating design from the top right corner. I made a simple envelop backing with some paw fabric I found at WalMart. So that's one down and many, many more to go! 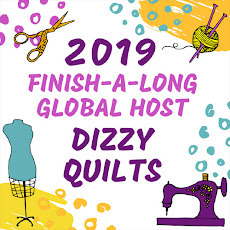 Later this week, I will be linking up at Crazy Mom Quilts for Finish It Up Friday and at Quilt Matters for TGIFF. I've been wanting to make another quilt for my sweetie (he already has one I made a few years ago), but I just couldn't decide on what pattern or design to choose. Then back in August, I was scrolling through the Summer 2014 Edition of Modern Quilts Unlimited when I saw it - the perfect quilt for him. He took guitar lessons a few years ago and loves to play. A guitar quilt was just the thing for him. I really liked the design, but it wasn't the right kind of guitar - this was an electric guitar, and my sweetie plays accoustic. 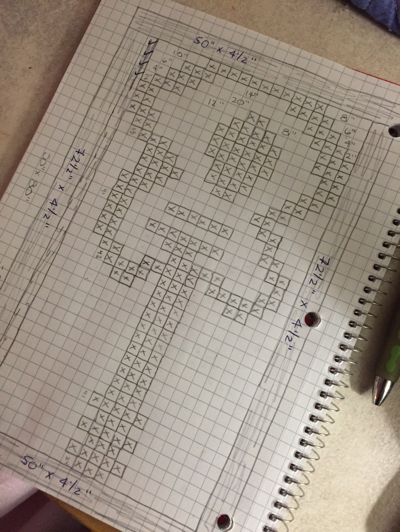 So I took out my graph paper book and started planning out the design I needed. I started cutting on August 10 and I had a finished top on August 12. It was super fast and easy. This was perfect to use scraps, but I also had a bunch of mini charm packs that I wasn't particularly in love with - a little too traditional for me - so I decided to use those. There are fabrics in there from Holly Taylor, Minick & Simpson, Blackbird Designs, Barbara Brackman and French General. The background is Kona Snow and Kona White. 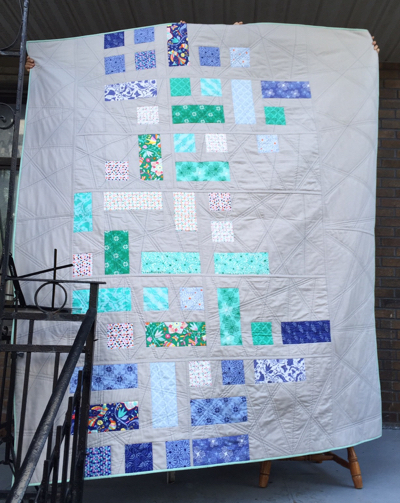 I had no idea how to quilt it, so it sat in my sewing room for a couple of months. Then I decided finished is better than perfect, so I pulled it out a couple of weeks ago, pieced a backing from some more traditional fabric that had been languishing in my sewing room and got started with the quilting. Some straight lines, some big stippling and some FMQ Xs in the coloured squares. Nothing fancy, and nothing too dense - I really wanted the quilt to be nice and soft once it got washed. I used a scrappy binding in the same types of fabrics and colours as the top. The finished size is about 60" x 80" - perfect to snuggle under on a cold winter's night and watch TV or a hockey game. I love that my children keep asking me to make stuff for them! They each have a quilt which they sleep under every night and the girls all have makeup pouches. When it was time to prepare everyone for back to school, both girls asked that I make them pencil cases. And, of course, I was happy to oblige! First, Marianne who requested something pink. 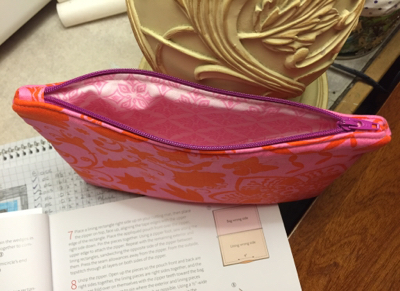 I used some Kate Spain fat 1/8s for the exterior and the lining of the pouch as well as a really beautiful purple zipper. For Brittany, we had to have purple. I found some Art Gallery Oval Elements fabric in my sewing room for the exterior and a Me & My Sister print for the lining.